We would like to invite villagers to sponsor a cushion to commemorate either a special event in yours or your family’s life. This could be a special anniversary, a graduation, a wedding, christening or something you think is special in the village perhaps. The quality of the cushions will ensure that you have your place in history within the church for up to and possibly more than 50 years. Whilst you would be made very welcome, you don’t have to be a regular churchgoer to take part in this. Others will benefit and you will too if you are attending an event in the church in the future. We also invite all of our village clubs and groups to sponsor a cushion. We have costed out a price for the materials for each of the 40 cushions. They will be 1 mtr long by 40cms deep and 2.5cm thick, using British wool and filled with high grade premium foam for comfort. The charge to you would be £75 for the materials only and the design will be done by Ann Nicholson who will work with you to create your design. All the time taken to create the cushions will be given freely by the group or you might like to create your own cushion. Anyone is welcome to join the group which will meet from 7pm until 9pm on every 4th Monday evening of the month at The Bell. 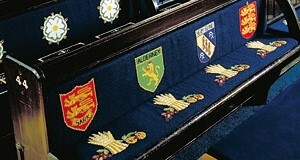 for a chat about sponsoring a tapestry pew seat pad or if you’d like further information.